Network Access Solutions (‘NAS’ or the ‘Company’), headquartered in Herndon, VA, is a leading provider of digital subscriber line (DSL)-enabled networking solutions to individuals and businesses. Looking to increase its revenue base and achieve profitability, the Company acquired several competitors in 2001. The anticipated revenue growth never occurred due to unexpectedly high customer attrition and deteriorating industry fundamentals. NAS implemented several restructuring initiatives, but was unable to get its costs in line with revenue and as a result filed for bankruptcy in the second quarter of 2002. SSG was retained in July 2002 to sell NAS in order to maximize value to secured creditors. 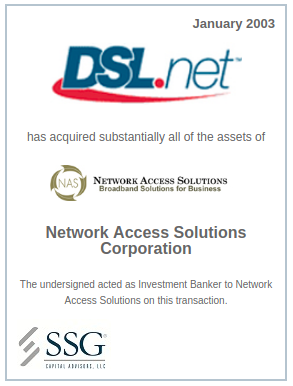 Upon selection of a platform bidder and subsequent Section 363 Asset Sale, the NAS network (representing the majority of the Company) was sold to DSL.net, Inc. The Transaction closed in January 2003. The remaining portion of the business will be sold in a separate transaction and is expected to close in the near future.